This interactive laser display solution eliminates the hassle and costs of maintenance while delivering impactful and collaborative meetings on a large scalable display to promote greater knowledge sharing and enhanced communication. Featuring finger-touch/dual-pen capability, Full HD WUXGA resolution, the ability to share two sources onto one display, and wireless and remote multi-location connectivity. Ensure everyone can read all forms of content with a large scalable laser technology display combined with Full HD WUXGA resolution and Epson’s 3LCD technology. HDMI connectivity also means that the audience benefits from sharper and clearer content displayed in any meeting room environment. 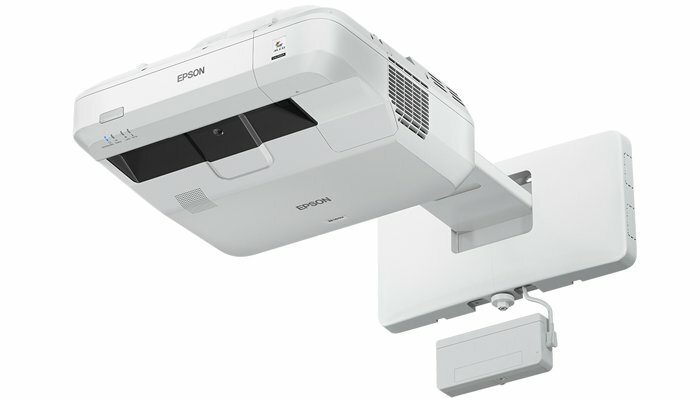 Share and present content easily from a range versatile connectivity features, including from Auto power on, or simply connect wirelessly using Epsons iProjection App or screen mirroring feature1. This interactive meeting room solution combines the benefits of flipcharts, whiteboards and conventional screens into one unified meeting room solution. Meeting participants can view and annotate whiteboard content from a range of mobile devices, without the need for any special sofrware, while ensuring information remains secure with the ability to apply passwords to meetings and notes. The remote desktop feature promotes freedom from the desktop – simply leave your PC, including those running Windows 10, on your desk and present from anywhere in the office. Take advantage of Skype in business and other video call solutions during meetings.